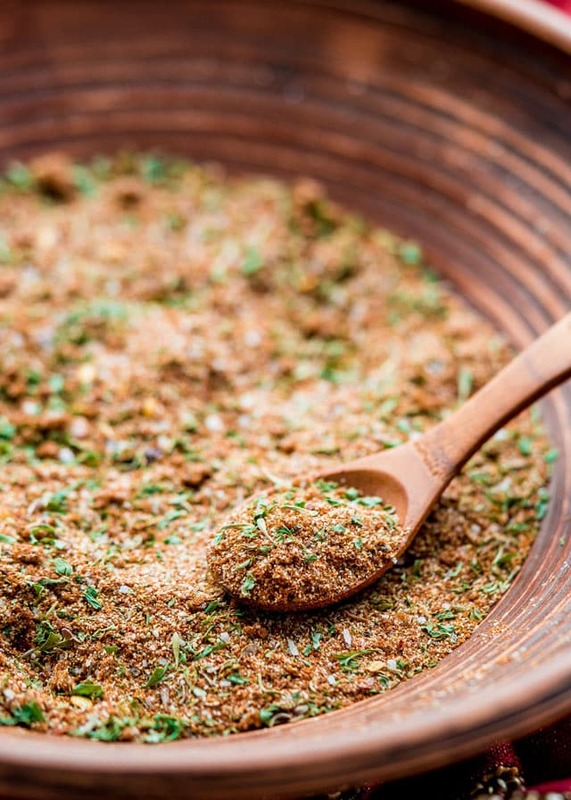 This Jamaican Jerk Seasoning blend is made right at home. Save your money and make your own with a kick from a blend of spices such as cayenne pepper, cinnamon, nutmeg to name a few. 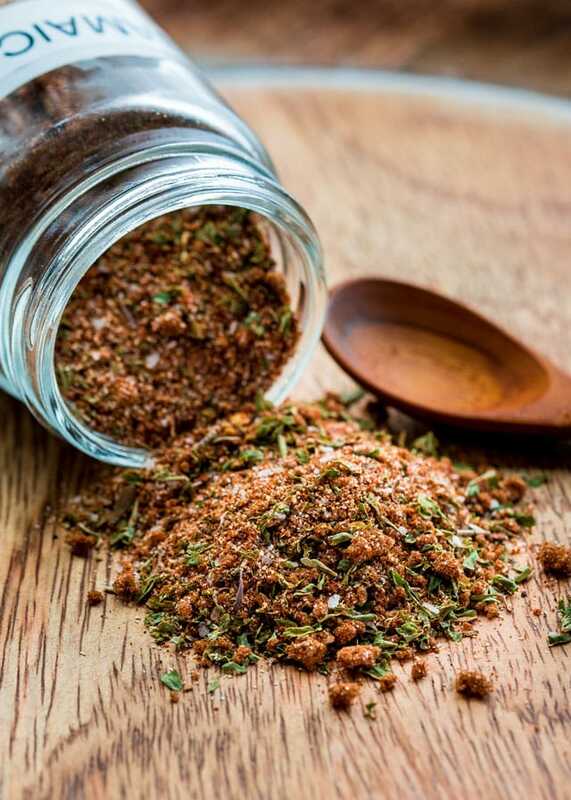 Today I have something different to share with you, a spice blend recipe. I usually don’t share these types of recipes with you but I think I should because many times you guys will comment or email me and ask me for certain spice blend or sauce recipes. So hopefully you guys like these posts and want more. 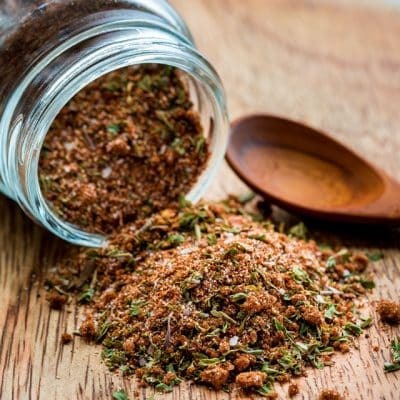 Today’s spice blend is a dry Jamaican Jerk seasoning or spice blend which is amazing and I usually have a hard time finding this at my local grocery store, so this time I decided to make my own. I have many spice blends in my spice cabinet that I make myself and I love them because you can get as creative as you want and you can customize them for your taste palate. The spices I used in this blend are quite common and I’m betting you have most of them in your pantry already. There are no weird spices here and most of them you probably already use in your everyday cooking. I actually wanted some Jamaican Jerk seasoning for this recipe with prawns, but there are so many things you can add this spice to. I’m looking forward to some jerk chicken, my mouth is watering just thinking about it. Mix all the ingredients together in a bowl. Recipe will yield about 1/2 cup. Store in a spice jar in your spice cabinet. You can adjust the salt to your preference, or completely omit it from this recipe. Just made it – so simple! The man, who loves all things spicy and Jamaican Jerk in particular, says this is “life changing”. Thank you! I am not a “hot spices” lover, but I made this recipe up for my dear older brother. He rang me this morning, (15th March 2019) to ask if I would make a bigger batch up for him, as he absolutely loved it! He marinated his meat for the barbeque, and just used the last of his mixture. As the batch I previously made him was tripled, I now have to mix up double that, so it says a lot about how much this recipe has been received. Thank you, and I now think I will make a huge mixture, pop into food seal bags, and give as gift to both my brothers, and a nieces husband..
That sounds awesome! Let us know how it turns out. I own a food truck and we sell jerk chicken! We lost the family recipe this year so my family had a contest to see who can make the best! I used this recipe and HOLY MAN! DELICIOUS! 5/5 and Chubbies LLC will be producing over 100lbs of chicken every summer with this recipe. Thank you! Wow, so so glad you like it!! Great flavor! We made for dinner last night. We are keeping this recipe. Thank you. Thanks for this recipe! I will make it because then I can adjust for much less heat, which is my preference. I have had jerk chicken, jerk pork, etc. and love the flavor, but it always burns my mouth and I can’t finish. And you know, I always thought I tasted oregano in their seasoning, but maybe it is actually thyme. It’s probably thyme, but if you don’t like it you can switch it. I made this Jamaican Jerk Recipe and Marinaded it for 2 days. I smoked the chicken on my smoker. This chicken won 3rd place in a cook-off. Thank You! You would have gotten first place if the judges knew you better or if you slipped each one a fiver. Sound like a great seasoning to make. Is it optional to omit the salt all together? If not, why? You can omit the salt if you wish, it really shouldn’t affect the flavor of all the other spices. LOVE this! I like making my own spice blends (like my own Taco seasoning) because I can make them without any added salt. All these pre-packaged seasonings have so much sodium, it’s GREAT to be able to mix your own! GREAT JOB, JO!!! Keep ’em coming!! Thanks Marcelle! I totally agree with you on the salt content, you really don’t need that much salt to add flavor, the other spices do the job nicely. I’m thrilled to see spice blends from you. Oh stay tuned for my prawns with this seasoning, you’ll love that too! This is great! I much prefer making my own spice blends at home as opposed to buying packaged ones, which have ingredients I’d rather not feed my family. Thanks for sharing!